CyberAlert's white papers offer the latest news and trends and media monitoring, measurement, PR and marketing and are free to download. Measurement is the best way to prove the value of public relations to clients and executives. 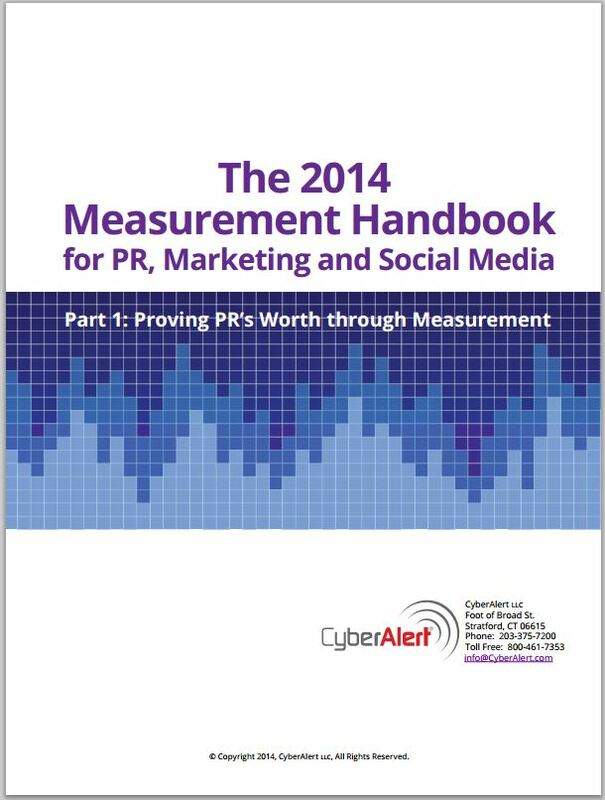 Proving PR's Worth Through Measurement, the first chapter of CyberAlert's 2014 Measurement Handbook, shares up-to-date and worthwhile insights, strategies, tactics and tips to help internal PR departments and agencies plan and execute PR programs. How do likes and followers help your brand? Social Media Measurement: Techniques to Achieve Real Insight, the second chapter of CyberAlert's 2014 Measurement Handbook, explains how to transform social media metrics into actionable business insights. An effective social media strategy begins by asking "What are the business goals?" With specific goals, marketers can develop more targeted social media content, measure that content more accurately and gain insights to improve marketing campaigns. 55% of website visitors spend fewer than 15 seconds on the page. 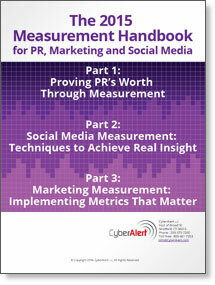 Marketing Measurement: Implementing Metrics That Matter, the third chapter of CyberAlert's 2014 Measurement Handbook, explains explains that metrics like page views don't always accurately represent marketing performance. An integrated measurement approach reduces biases in any one measurement method, enabling leaders to identify which marketing activities produce the best return. Effective media monitoring now benefits many different business functions in addition to PR and marketing. 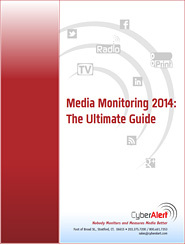 Media Monitoring 2014: The Ultimate Guide explains how you can get the most benefit from news and social media monitoring and minimize media monitoring costs. The 40-page white paper covers a comprehensive range of media monitoring topics, including separate chapters on effective strategies to get the most from monitoring online news, social media and broadcast news. Learn what media monitoring is, how it's evolving and what companies are doing now to protect their reputation. The 26-page white paper covers online news and print monitoring, social media monitoring, TV monitoring and radio monitoring.